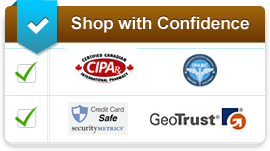 Search for medication(s) you would like to buy and click on "add to cart". Once the product has been added to your shopping cart, you may sign-up as a New Customer, or you can login as an Existing Customer. If you have selected "New" customer please complete the basic sign-up information. Print the prescription order form if you have ordered a prescription item. 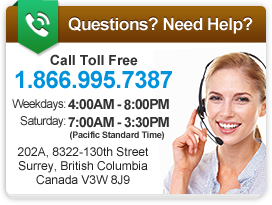 Call 1-866-995-7387 if you would like to place your order with one of our customer service agents. We are open from 5:30AM - 6:00PM on Monday to Friday, and from 7:00AM - 3:30PM on Saturday and Sunday (Pacific Time). During all other times, you may still place your order online or by faxing or mailing our customer sign-up forms. To place an order by mail, fax or email, you can download and print our order form.